As a part of Heath Service programs on 04-01-2015 , Awareness Seminar and “Anemia Tests“, were conducted in Local Tribal Welfare Residential Junior College. Under the supervision of Bhadradri “JayaBharathi Hospital” these tests and Seminar were conducted. Dr.G.V. 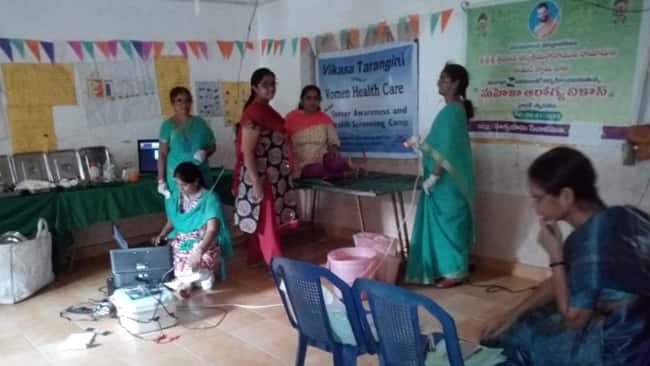 Sudarshana Rao and Dr. Jayabharathi along with their team conducted this camp who are also our Vikasa Tarangini Supporters which is a great thing. Mainly in Agency Areas Anemia in women is the most common problem. Due to this problem these women were not able to do their works actively.The girl students who were suffering with this problem are facing more difficulties. This Seminar is conducted with the main motto of “Empowering women which will empower their families”. Totally 504 Intermediate girl students were conducted blood tests from morning to evening by Jayabharati Hospital team and among them more than 60% were detected to have less blood percentage and only one girl is with correct blood percentage. Dr. G. Jaya Bharathi created awareness on bloodlessness through a power point presentation in the seminar conducted in the evening. Dr.G.V. 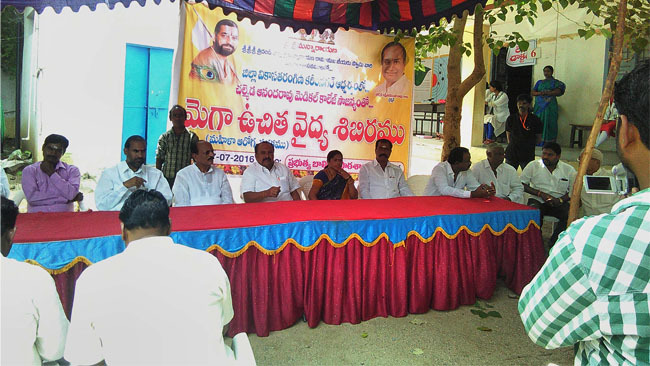 Sudarshana Rao garu announced the results of blood tests. The girls with Anemia problem are provided with medicines at free of cost by the representatives of Warangal “Encure Pharma”. Encure pharma announced that they’ll provide their cooperation for this kind of programs and they becoming partners in our Vikasa Tarangini Seva is appreciable. Some medicines were distributed through Vikasa Tarangini. In this program on behalf of ITDI, additional Health Chancellor Dr. Pullayya announced to provide free medicines on his part and he praised Vikasa Tarangini conducting this great event. Vikasa Tarangini women volunteers provided their services as supporters in this event. The guests were given memory shields. Principal of junior college Sriman N.V.Manikyala Rao not only provided food facilities also felicitated guests with shaals. He also said that it has been a great opportunity as their college is being a part in creating awareness on Anemia through the seminar and thanked Vikasa Tarangini.